A simple search of each woman’s name provides several accounts of how each received probation. There was no need to post these lies—if their goal was to fight racism. The people who created it knsw its a lie. The people who repost it don’t care whether it’s a lie, and so don’t bother to verify it. That this is an example of fair treatment, not biased treatment, is something to hide. When I provided a link to a local Phoenix newspaper with more information the poster deleted their post, ensuring that nobody among the poster’s circle could learn it’s just lies. It wasn’t posted to help. It was posted to hurt. You might think, of course, that someone who claims to care about unfairness would have left the post up along with an apology for hurting the people mentioned in it, or removed the post with an explanation so as to halt the spread of hurtfully fake news. The left doesn’t care. They don’t care about the individuals they hurt. It wasn’t posted to address racism. It was posted to create racism. It was posted to increase racial discord in America, and stop the hemorrhaging of votes from Democrats. 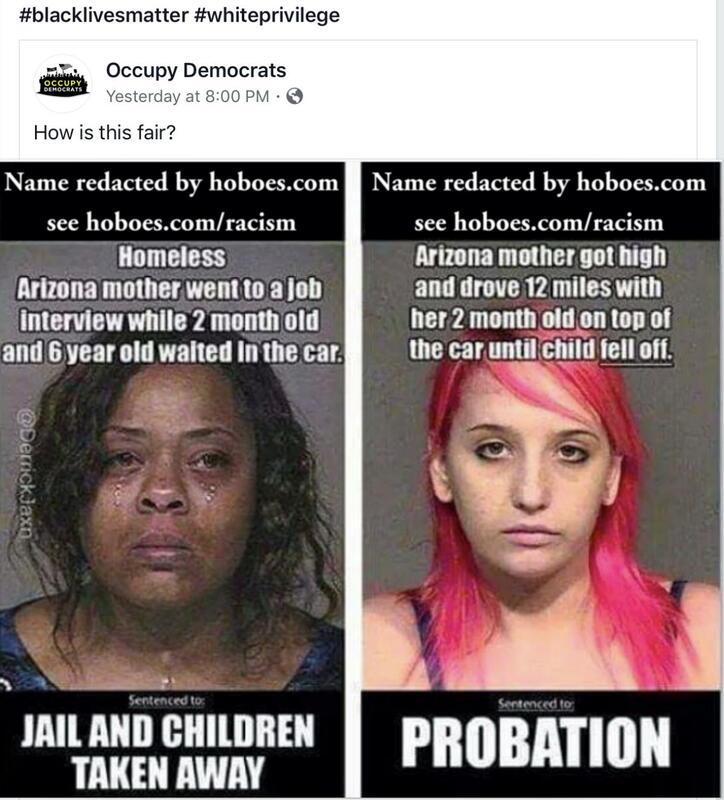 Occupy Democrats and the people who pass on their memes know what they’re doing, and they do it because the left’s infatuation with racism and racist behavior is not about stopping racial discord. Judge them by their actions—by the actions of the Northams, Omars, Warrens, and the people who create and post these lies—and it is clear that they want racial discord. They lie in support of it. They hurt people in support of it. Racial discord is more important to the left than any concern about political lies or homeless women in tough situations. Regarding Blair, D’Souza may have been right, or at least, Blair may not be a counter-example. According to Missouri, the Center State Blair had freed his slaves by the end of 1859. If correct, he would not have been a slaveowner in 1860. Was the reviewer’s response to provide a better, contradictory source? To acknowledge that that part of the review was incorrect? No. The response was another of the vicious lies in the arsenal of the left. It is also an historical fact that, since 1964, the national Democratic Party embraced fully the struggle for civil rights and that those Southern Democrats who couldn't stomach the change switched parties to the Republicans. Strom Thurmond does indeed seem to have been a horrible person: when he was a Democrat. But after he became a Republican? In 1971, Thurmond was among the first southern senators to bring blacks on to his personal staff in Washington; he also began to nominate an increasing proportion of them to the horde of federal posts on which any senator has a say. In 1982, he supported moves to proclaim Martin Luther King’s birthday a national US holiday—no big deal to the world at large, but a remarkable stance in South Carolina. In 1995, in a gesture that would have been unthinkable only a decade earlier, he was guest of honour at a Washington function to celebrate the successes of racial integration. Doing the jobs Americans won’t do: beat up black gays… What turns it into the level of mass insanity is the American media insisting that this is who we are in 2019. The fact is, racism outside of the left’s small circle of leadership is no longer a problem in the United States. We only have to look at the sad affair of Jussie Smollett. He had to pay someone $4,000 in Chicago to assault him. Not only couldn’t he get racially attacked in one of the most violent cities in America, beating up blacks turns out to be one of those jobs Americans won’t do. He had to pay Nigerian immigrants four thousand dollars to get beat up in Chicago. The left’s strategy of identify politics requires hatred. Without race hatred, identity politics doesn’t work. When racial discord is so obviously receding that a black man can’t get beat up in Chicago without paying thousands of dollars to make it happen, the left needs to restore hatred or lose elections. Their lies are only going to get worse, and more violent, as we get closer to 2020. In response to 2019 in Photos: For photos, memes, and perhaps other quick notes sent from my mobile device or written on the fly during 2019. Stolen, I believe, from The Macalope. Grant had one slave; his manumission documents are dated March 1859. See page 34 of Missouri, the Center State. If you count 1975, there’s also John Jarman of Oklahoma, but his switch appears to have been entirely symbolic; he never ran as a Republican, so we have no idea how Republicans in Oklahoma would have treated him in a primary; for that matter, Albert Watson, the other of the two Democrats who switched, lost his election five years later; he only won two elections as a Republican in an area where Republicans normally didn’t even bother to run a candidate. Southern voters do not appear to have switched parties any more than Southern politicians did. For an analysis of the salutary effects of the Lincoln model and the destructive effects of the Democrat model, read Thomas Sowell. A 1915 history of Missouri, from 1821 to 1915. The left’s vicious racial shaming last modified March 27th, 2019.